Sweetgrass knows that a vacation is all about relaxing and having a good time with friends and family. Below you will find our policies and "The Sweetgrass Standard" of taking care of both you and our properties during your vacation. You will find our policies to be above and beyond the industry standard. We make sure that all of our guests take great care of our homes and we take great care of our guests. Please take a few moments to read over this policy. 1. The person placing the reservation (the “Renter”) must be 25 years of age or older to place the reservation and check-in. 2. Renter and Renter’s guests (collectively referred to as “Guests”) acknowledges and understands that he/she is or are a temporary guest(s) of the property and not a tenant. 3. This rental agreement (“Agreement”) is unique to the Guests and may not be sublet or otherwise assigned to any other persons. Check-in time is 4:00pmand check-out time is 10:00amunless you have received written or email documentation from Sweetgrass detailing otherwise. I agree and understand my credit card will be charged and I will be billed at a rate of $100.00 per hour for early check-in or late check-out.As the undersigned Guest, I am responsible for all actions of my group including late and early check-in, even if I am not present. As the group leader I agree and understand it is my responsibility to inform all members of my group about the rules and regulations of the property I am renting. Guest understands that Sweetgrass accepts no responsibility for the dependability of Comcast, Dish Network, AT&T, DirecTV, or any other service provider’s service. We do our best to keep all routers and cable working properly. We guarantee that the service is paid for and that is all. Should Internet go down at any home we will make every effort to restore service and will bring to the home a temporarywi-fihotspot at our earliest convenience. The hotspot should only be used for things such as checking email and other basic Internet functions. Please no streaming video. Should any data plan overages occur while the hotspot is in your possession you will be billed for all additional costs. NOT ALL PROPERTIES HAVE A LAND LINE. For those that do, for long distance calls, cell phone use is recommended. Most properties that have a residential phone line have blocked long distance. Charges incurred during reservation for phone services outside of local service (411, long distance, collect calls, etc.) will be guest`s responsibility. We are open 7 days a week, 365 days a year from 9 am – 5 pm. If you should experience any difficulties that need our assistance during these hours, please call 855-421-1309. Should you have an emergency after hours, call 843-697-7950 immediately. You will also find our emergency number on the outgoing voicemail greeting. Guest agrees to use only the parking spaces provided for the property. Offending vehicles may be towed or booted at Guest`s expense without notice. Motorcycles, campers, RVs and boat trailers are not allowed. Some homes will require a pass to enter the gate. If your home does require any special passes, we will notify you, and provide you with corresponding materials. All security guard gates are open 24 hours a day. If you are staying onKiawah Island,we will email you a gate pass 30 days prior to your arrival date. It is your responsibility to forward this on to all driving parties. Everyone in your party may use the same printed pass. Please print this gate pass out and have it on your dashboard when you approach the gate. Please know that the Kiawah Island Guard Gate no longer issues passes as of 4/01/14. All vehicles will need to have a pre-printed pass before approaching the gate. If you are staying onSeabrook Island you will pick your gate pass up at the guard gate when you arrive. You will need to give them the name on the reservation and the property address. If you are staying in Wild Dunes, you will receive a one day gate pass prior to arrival, that must be pre-printed for each vehicle in your traveling party. When you enter your rental property you will have the passes inside for the duration of your stay. If you are staying in theSea Cabin community on Isle of Palms, a parking pass will be left for you inside the property. After you have entered the property, please go back to your car and place this pass on your dashboard. If your vehicle does not have this pass displayed you may be towed. On the outside door of your rental property you will find a lock box or a keypad. The key to access the property can be found inside the lock box (if your property has one). Your lock box or keypad combination will be provided in your email confirmation. Guests are responsible for returning all keys to the property and a lost key will result in the credit card on file being charged $35 per key. Being locked out of the property after hours will result in the credit card on file being charged a $100 fee. We recommend that you leave a key in the lockbox at all times to prevent being locked out of the property. An amount equal to 40% of the reservation (the entire advertised rate amount for the rental is the “Reservation Amount”) is due and payable to Sweetgrass Propertiesat the time of booking your reservation. Thirty percent (30%) of the Reservation Amount constitutes a non-refundable amenity, preparation and booking fee, which is included in the advertised rate for the rental unit, and is not a rental deposit. The remainder of the Reservation Amount will be held in accordance with the South Carolina Vacation Rental Act as a deposit. A credit card is required for the initial amount due (even when paying by check) which will be used as your security deposit as detailed below. If we do not receive a check before then, we will automatically draft the balance due from the provided credit card 30 days prior to arrival. The Final Payment is NON-REFUNDABLE at 30 days prior to arrival, no matter the cause of cancelation. Amounts received by Sweetgrass toward the Final Payment prior to 30 days before arrival will be held in accordance with the South Carolina Vacation Rental Act. Because the Final Payment amount is non-refundable at 30 days prior to arrival, Sweetgrass strongly encourages the purchase of travel insurance. If you have purchased travel insurance from Red Sky along with your reservation and have to cancel, delay or change your reservation for a covered reason, please notify Sweetgrass immediately and we will gather the information needed for the Travel Insurance Company. Reimbursement will not be issued via Sweetgrass, although we are happy to assist with your claim with Red Sky. Information on Travel Insurance is available on our website underGuest Information / Travel Insurance. There you will find links to information on RedSky and the actual policy details. Renter agrees to provide a security deposit in the form of a VISA, MASTERCARD, DISCOVER or AMEX credit card. Sweetgrass Properties reserves the right and the guest authorizes Sweetgrass Properties to charge the guest`s the credit card for the cost of repairs, replacement, services, telephone charges or extra cleaning for all damage, breakage and/or loss incurred during his/her stay. In the event of damage to the premises, its equipment, furniture, or carpeting, Renter shall be responsible for damage ANY and ALL costs, including collection costs and attorney`s fees. Documentation detailing damages and charges will be provided to the guest. Every guest will be required to purchase an Accidental Damage Insurance Policy for new reservations. This is a non-refundable fee. The cost of this policy is $60.00 per reservation for homes three bedroom or smaller and $105.00 per reservation for any homes that are four bedroom or larger. This fee will cover accidental damages to the unit up to $1,500.00 in value.While we hope this is never necessary, in our experience this should cover most incidents. If the damage to the property exceeds the amount of coverage listed, the guest is responsible for the balance and the pre-authorized credit card we have on file will be charged for the balance of the damages. All damages must be reported to the manager by each guest immediately in order for the policy to cover the damage. Charges incurred for properties needing extra cleaning services upon departure are not covered. Neglect, disregard or intentional disrespect for property and its furnishing are not covered under fee and guests will be responsible for damages.For short term rentals, guests may be required to pay accidental damage fee for each week of rental period.Please do not hesitate to report an accident as this policy is in place to protect the property but also encourage guests to work with the managers. Sweetgrass prides itself on maintaining our homes to the very best of our abilities. We understand that you are on vacation and expect to have a great time but it is important you also have reasonable expectations.You have rented a home and just like any home, things may break and problems may occur. We find that the more we disclose to our customers the less likely they are to be dissatisfied with the level of service we can provide on short notice.Sweetgrass does everything in our power to make these homes as pristine as we can but sometimes things go wrong and there is no immediate solution. For example; parts may need to be ordered and maintenance may need to be scheduled. Unlike a hotel room, which are usually simplistic in design, a vacation rental home is very complicated and has a lot more features and amenities at a reduced price. Compensation will not be given for any of the listed items or any other items at the property that malfunction, which are out of our control: Clogged sinks and bathtubs, light bulbs, refrigerators, toasters, washer/dryers, televisions, Internet routers, DVD players, grills, ovens, microwaves, pool filters, blenders, dishwashers, wine fridges, griddles, stereos or stereo equipment, hair dryers, straighteners, remote controls, DVRs, fireplaces, ceiling fans, and coffee pots. We will attempt to replace, fix, or schedule maintenance to repair these items as soon as possible. Some items may take longer than others. It is important to fix things when they break, our homeowners are billed for the time it takes to repair items on the property, therefor if maintenance is turned away for any reason the Guest will be held responsible and billed for this time. Please report any damage that you notice to our office by phone or by email at [email protected] you check-in to avoid getting charged for damage you didn’t create. Reporting the condition of property is your responsibility if you do not want to be held accountable for any damage. Guest understands the property is furnished and decorated to each home-owner's tastes. Guest has viewed pictures of the property on www.sweetgrassvacationrentals.com and is satisfied with room decor, size, and location of the property. Guest promises to exercise care in the treatment of the accommodations and furnishings. Any rearranged furniture must be put back the way it was when you arrived. We simply ask that you treat the property of our home-owner's with the same care and respect you would expect of someone staying in your own home. All properties are privately owned and individually furnished with the basic items such as pillows, blankets, cookware, flatware and dishes. Other small appliances, local telephone, beach chairs, beach towels, extra blankets or pillows, blenders, wine glasses, etc., may or may not be provided.Sweetgrass may attempt to obtain requested items at additional cost to guest. Sweetgrass Properties takes the heating and air conditioning of a house seriously and we do consider this an emergency, please call us 24/7 the moment you suspect there is a problem. Do not email on this matter, please call. Sweetgrass puts the heating and air of a property at the top of its priorities. Be aware it can take anywhere from 3 to 10 hours to repair a unit, and in rare situations parts may need to be ordered, which may result in the guest being moved to another property of equal size and value. All notices of cancelation must be in writing. Except as may be provided by Travel Insurance, cancelation at any time results in forfeiture of your initial payment, which is nonrefundable. Cancelation within 30 days of arrival results in the forfeiture of the entire amounts paid, which are nonrefundable.Refunds are not given for cancelations for any reason including weather, travel delays or illness. In the event Sweetgrass is able to re-rent the property to another guest, a refund may be provided for the amount the property is re-rented, less a 10% cancelation charge. There are no refunds for early departures. Should the owner of any property elect to remove their property from our rental program, the Guest shall not hold Sweetgrass Properties liable. In such an instance, the guest will be relocated to comparable accommodations determined by the rental agency. If comparable accommodations are not available, the guest will receive a full refund. Sweetgrass will not refund for any weather-related issues, including but not limited to, tropical storms, hurricanes, tornadoes, snow, etc. The inability to get to the property due to the weather is not a cause for a full or partial refund. Please make sure to consider all of the benefits of Travel Insurance before deciding whether or not to purchase it. Sweetgrass properties are self-catering. The property will be clean upon your arrival and will be cleaned after you leave. The property will be set up with fresh bed linens, bath towels, and a toiletry start-up kit when you arrive.Unless otherwise arranged, you are responsible for additional toiletries needed during your stay as well as any mid-stay cleaning such as taking out the trash, washing dishes, and washing the Sweetgrass provided linens. I, the Guest, understand I will pay a $500 excessive mess cleaning fee if I leave the property in a disorderly fashion. When leaving the property, it should be just as I found it minus dirty linens and trash which needs to be taken out. Sweetgrass does not intend, nor do we want to charge this fee to anyone, but we will not tolerate abuse of our lovely homes. Mid-Stay Cleanings may be purchased for an additional charge. A Mid-Stay clean includes fresh towels and linens, another toiletry start- up kit, trash take-out, dishwasher loading and a light cleaning/vacuum. Please contact Sweetgrass [email protected] pricing and coordination prior to arriving. Guest agrees to maintain the cleanliness of the premises during occupancy.Guest promises to exercise care in the treatment of the accommodations and furnishings.Guest agrees to leave Sweetgrass Properties property, premises and furnishings in clean and undamaged condition. This includes starting the dishwasher, taking out the trash, and making sure all doors and windows are closed and locked upon departure.Guest further understands that Sweetgrass Properties reserves the right, and guest authorizes Sweetgrass Properties to charge guest for items not completed, any necessary repairs, and/or for any unusual degree of cleaning which may be necessary. Guest shall not bring, keep, or have either inside or outside the premises of Sweetgrass Properties property any article or thing of a hazardous nature, including fireworks, explosives, flammable items, firearms, gas, charcoal, or propane grills, or any other item that either might be or could be hazardous or considered hazardous by any insurance company. Sweetgrass may enter the premises at any time in the event of emergency, but will use its best efforts to give 24-hour notice for normal maintenance or sales inspections. Each property has a specific maximum occupancy. Take note of the maximum number of guests allowed in the homes and condos before making your reservation.Occupancy and use of the home, suite(s), courtyard, and common area of the property by guest, or other visiting invitees of guest shall not be such as to disturb or offend neighbors, nearby residents, or other guest of the property.Guest understands and agrees that the maximum number of occupants as stated on your Confirmation Letter must not be exceeded and in the event that the maximum occupancy is exceeded, Sweetgrass Rentals and the Town Fire Marshall will evict immediately without notice any number of guests in excess of the maximum occupancy number or the entire party. This rule and requirement is made a part of this agreement for insurance regulation requirements, fire code and city ordinance requirements, and particularly for the safety of guests. Sweetgrass Properties has the right to inspect the property during your stay to guarantee that this stipulation has not been violated. No weddings, receptions, events, reunions, or parties of any kind are to be held at the property or in the courtyard or open areas without the written consent of Sweetgrass Properties.Events require a separate Event Agreement and Event Fees. The definition of an event is any gathering of people at the property that exceeds the number of people sleeping at the property as stated in the confirmation letter. Sweetgrass Properties has the right to inspect the property at any time during your stay to guarantee that this stipulation has not been violated. All Sweetgrass Properties are Non-Smoking. Should we discover you smoked on the rental property you will be asked to vacate the property immediately without refund.You will also be charged a deep clean and the equivalent of one days rent which, when combined, usually amounts to over $400.00. Pets are permitted in some of our properties but not all of them. This will be specifically noted on each property’s information page and will be detailed within your confirmation. Guests are responsible for any and all damages caused by their pet.Each Island’s seasonal and year round leash laws must be obeyed at all times. Any guest found with a pet in a property that is not pet friendly will be required to vacate the premises without refund. You will also be charged a fee for pest control, a deep clean, and an equivalent of one days rent which, when combined, usually amounts to over $600.00. This is strictly enforced.PLEASE MAKE SURE YOU READ ALL OF OURPET POLICIESLISTED ON OUR WEBSITE UNDER THE"Pet Policies". Kiawah Island does not offer pool access to public.If pool access is important to you, be sure to search for properties that offer access to a neighborhood or private pool. 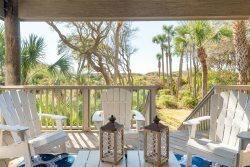 Seabrook Island offers public access to guest renting on Seabrook to their Lake House facility which includes an indoor pool, an outdoor pool, and fitness center at ADDITIONAL COST. Contact Sweetgrass or visit our FAQ section of this website for details. Guest acknowledges Sweetgrass Properties is not responsible for any loss of money, jewelry, or other personal items of Guests or any invitees of Guest. Any items left at a home will be shipped back to Guest at their request for a cost of $35 to cover labor expenses associated with making trips to properties and to the post office, plus the cost of shipping, and will be charged to Guest credit card. Guest hereby agrees to indemnify and hold harmless Sweetgrass Properties from any and all claims including those of third parties for damage to person or property, arising out of or in any way related to Guest or invitees of Guest use of premises resulting from the building or any part of it or any equipment becoming out of repair, or resulting from any accident in or about the building, or resulting directly or indirectly from any act or neglect by any Guest of the property, invitees of Guest or by any other person. Guest assumes the risk of injury and any related pain and suffering or medical expenses or other losses relating to the use of Sweetgrass property and/or recreational activities on the premises or in the city where property is located and will hold Sweetgrass harmless with respect thereto. Guest agrees to abide by the covenants of the Community Association and all Town ordinances. The Manager has the right to terminate this agreement and ask violators to vacate the premises. In which case, no refund will be given for remaining reserved days. Occupancy and use of the premises and communal areas shall not be such as to disturb or offend Guests or Residents (e.g. guests may not hang articles of clothing from window or balconies, bikes must be stored in designated areas, etc.) House parties and other large gatherings are not allowed. Our properties are located in residential areas and are rented for personal vacation use only. Loud music or other noise will result in immediate eviction without refund. If the noise disturbs other guests on the property, guest is also subject to financial penalties. Sweetgrass Properties reserves the right and prerogative to terminate this Rental Agreement and to ask disruptive guests to vacate the premises in the event of complaints or in the discretion of Sweetgrass Properties without the refunding of rental fee. ALL Violators risk forfeiture of their deposit, rental fees, eviction and even financial penalties. Sweetgrass assumes no liability for your stay in South Carolina or the activities that you partake in during your visit. Guest acknowledges that Sweetgrass Properties is not responsible for any loss of money, jewelry, or other personal items of guests or any invitees of guest. Guest hereby agrees to indemnify and hold harmless Sweetgrass Properties for damage to person or property arising out of or in any way related to guest or invitees of guest use of premises resulting from the building or any part of it or any equipment or appurtenance becoming out of repair, or resulting from any accident in or about the building, or resulting directly or indirectly from any act or neglect of any guest of the property, invitees of guest or of any other person. GUEST ASSUMES THE RISK OF INJURY AND ANY RELATED PAIN AND SUFFERING OR MEDICAL EXPENSES OR OTHER LOSSES RELATING TO THE USE OF SWEETGRASS PROPERTIES PROPERTY AND/OR RECREATIONAL ACTIVITIES ON THE PREMISES OR IN THE CITY WHERE PROPERTY IS LOCATED AND WILL HOLD SWEETGRASS PROPERTIES HARMLESS WITH RESPECT THERETO. The agreement between the Renter and Sweetgrass shall be governed by the laws of the State of South Carolina, without regard to the principles of conflicts of laws. If any dispute arises between the parties, all disputes will be brought and heard in the State courts of Charleston County, South Carolina. YOU HEREBY IRREVOCABLY WAIVE ANY RIGHT THAT YOU OTHERWISE MIGHT HAVE TO A TRIAL BY JURY IN ANY ACTION THAT IS BROUGHT AGAINST YOU IN COURT BY SWEETGRASS. Failure by Sweetgrass to insist upon strict compliance with any provision of this Agreement or to assert any right Sweetgrass may have hereunder shall not be deemed to be a waiver of such provision or right, or any other provision or right of this Agreement. A ruling by any court that one or more of the provisions contained in this Agreement is invalid, illegal or unenforceable in any respect shall not affect any other provision of this Agreement. Thereafter, this Agreement shall be construed as if the invalid, illegal or unenforceable provision had been amended to the extent necessary to be enforceable within the jurisdiction of the court making the ruling. This Agreement constitutes the entire agreement between the parties and there are no other representations, warranties, covenants or obligations except as set forth in this Agreement. This Agreement supersedes all prior and contemporaneous agreements, understandings, negotiations and discussions, oral and written, of the parties, relating to any transactions contemplated by this Agreement. Except as otherwise specifically provided, this Agreement is not intended and shall not be construed to confer upon or give any person other than the parties any rights or remedies.